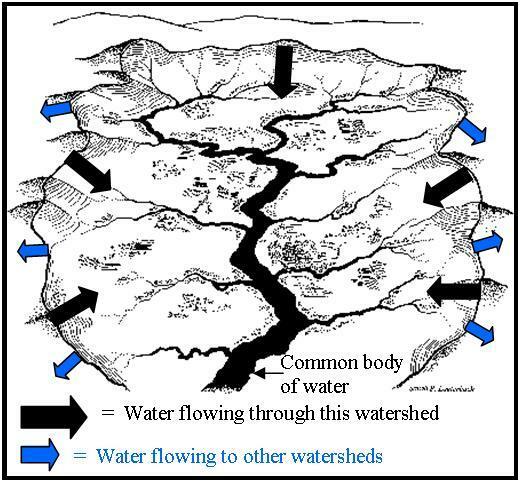 A watershed is a geographic area of land where all the water drains to a common body of water: a lake, pond, river or stream. By definition a watershed can be any size. As an example, you could say the there are three watersheds in the continental United States: the Atlantic Ocean, the Pacific Ocean and the Great Basin. Everything east of the continental divide drains into the Atlantic Ocean, everything west of the divide flows into the Pacific Ocean. There is also a region of the mountain west where the water stays without draining directly by river to either sea known as the Great Basin. Here in Monroe County we are all residents of the Delaware River watershed. Those of us living east of the Pocono Plateau drain directly to the Delaware via the Brodhead, Bushkill or Cherry Creeks. Those living on or South of the Plateau drain into the Lehigh River, on the way to the Delaware, via the Tobyhanna, Pohopoco and Aquashicola Creeks.